I made this card to enter in the Simon Says Stamp Flickr Challenge #75; Black and White with a Splash of Color. The title of this challenge inspired me to so some ink blending for my splash of color. Extra Details: I began with a small square of water color paper. I ink smooshed some orange Distress Inks on an acrylic black and pressed it on the paper. I let the paper and ink sit over night because I forgot about it. Once I remembered to remove the block, I let the paper finish air drying. 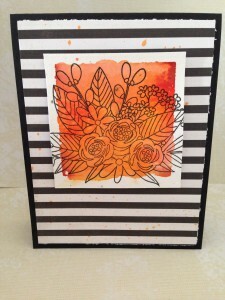 I stamped a large floral image with black ink on the water color square. I also added a few flicks of grey ink to the panel as well. I added some foam tape to the back of this panel and set it aside. Next, I created a black card base. I choose a panel of black and white striped patterned paper as a layer for my card. 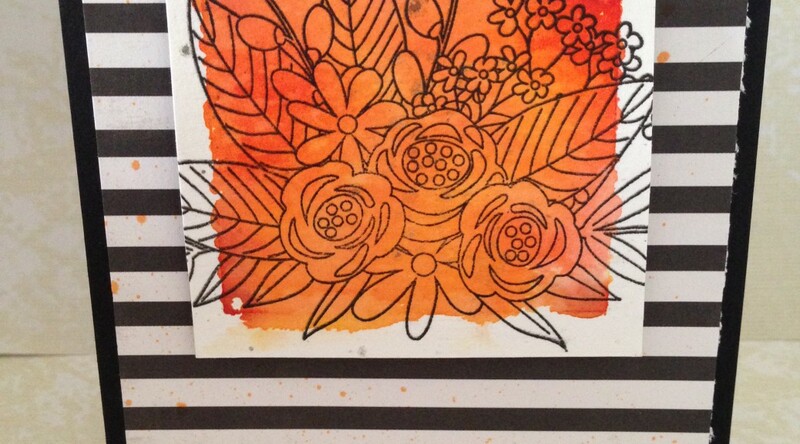 I added some flicks of orange ink to the patterned paper for added interest. I adhered this panel to the black card base and adhered the water color panel on top of it. I choose to skip a sentiment this time around. I like the versatility of not having a sentiment gives me.